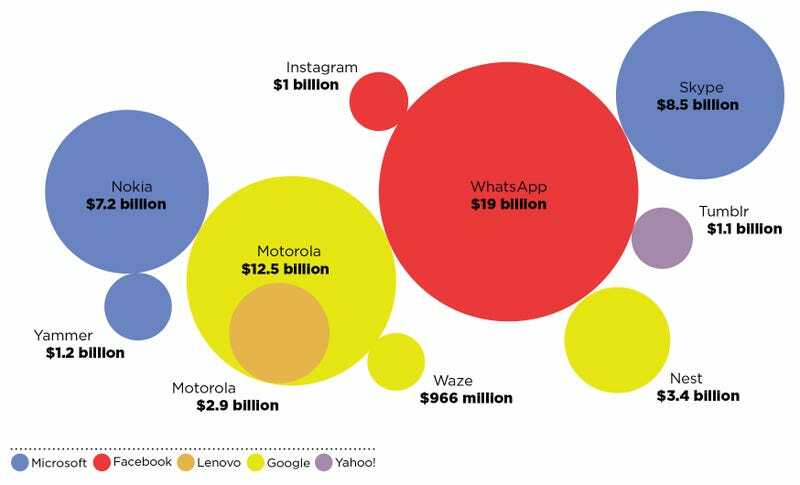 Facebook's $19 billion acquisition of WhatsApp was very, very, very, (very) large. But it's also just the latest in a string of mega-buyouts that's been reshaping the tech landscape over the last three years or so. We thought we'd try to put all these billion-dollar acquisitions into perspective. There are obviously some nuances at play here; the WhatsApp deal is largely stock, while some smaller deals are of the more dependable cash variety. Google kept Motorola's patents and advanced technology group, so it's not the huge loss it appears to be. Boston Dynamics, another big Google buy, isn't shown here because the sum wasn't disclosed. And it's too early to tell in almost every case whether anyone's actually getting their money's worth. But man, who knew, back when Instagram sold itself for a cool billion, that before long a deal like that would register wouldn't register as much more than a tick on the back of the great WhatsApp elephant? Maybe SnapChat wasn't so crazy for turning down $3 billion after all. Or maybe, just maybe, we should start getting the slightest bit anxious when bubbles start getting this big. Update: We've replaced diameter for area in the image above—it reflects the numbers a bit more clearly.